Solar Panels | Top Electricians | Winnipeg MB | Powertec Electric Inc.
Powertec Electric is proud to be a leader in environmental innovation, and is at the forefront of the solar panel installation industry in Winnipeg. Recent advancements in solar technology have resulted in more efficient solar panels and inverters being available at a fraction of historic prices. These advancements, coupled with Manitoba Hydro’s rebate program make it more affordable than ever to go solar, and the payoff period for many installs is under 10 years. In a grid-tie solar system electricity is generated from panels on the roof (or ground mounted panels), and converted from unusable DC electricity to usable AC electricity through an inverter. At this point any electricity that can be used by the property owner is fed directly from the inverter, but if more electricity is being generated than is being consumed, the excess energy is sold back to the grid. This eliminates the need for battery banks which are expensive and aren’t 100% efficient. Net metering means that when the business or household is consuming more electricity than it is producing the meter moves forward, while if more electricity is being produced than consumed the meter moves backward. In residential applications it is typical to use more electricity in the evening and produce more in the daytime, so the net metering allows for families to realize the full benefit of all the electricity produced, without the costs and inefficiencies of storing it. If you have a cottage that isn’t serviced by a utility company, or you simply like the idea of getting off the grid, then an off grid system is likely the best option for you. Off grid systems work similarly to grid-tie systems, except they are not connected to the grid, so when excess power is produced it is stored in a battery bank, and when there is a need for more electricity than is currently being produced, the batteries kick in and provide additional power. If you like the idea of being off the grid, but you also like the benefits of a grid-tie system, it is possible to install a hybrid system that can switch between accessing the grid, and using batteries. This way as long as the grid is up, you get all the benefits of a grid-tie system, but if the grid were to go down you’d have a fully functional backup power system. 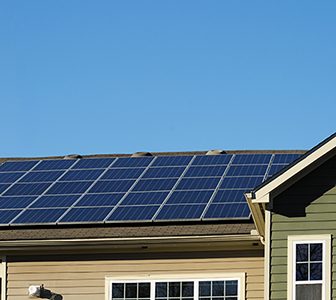 With over 30 Winnipeg electricians on staff with extensive experience installing solar systems, Powertec is the obvious choice for your Winnipeg solar panel installation. For more information on our products and services call us today, or visit powertecsolar.ca to learn more.